I believe the answer is yes. This may surprise some of my readers. 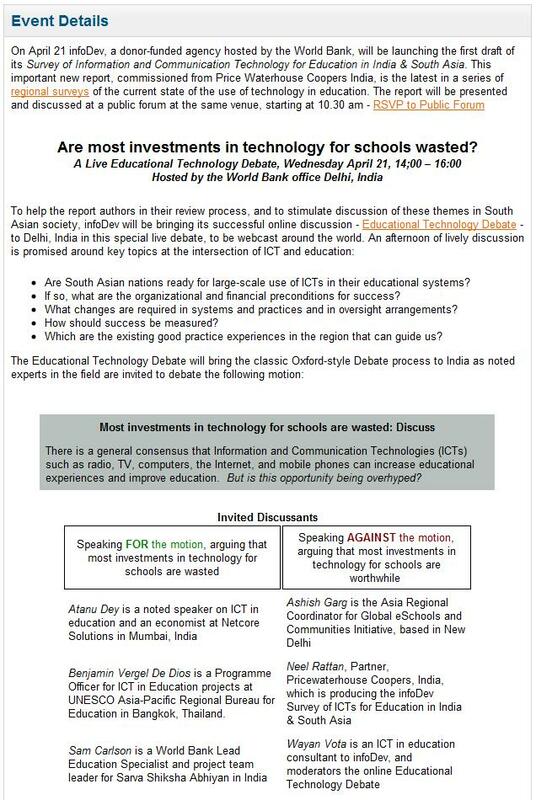 I am speaking FOR the motion that “Most investments in technology for schools are wasted” at an Oxford style Education Technology debate in Delhi on 21st of April. The debate is under the aegis of Infodev of the World Bank. Details below. But first, here’s how I understand the proposition. It is in the present tense — that investments are wasted. It does not say that investment in technology should not be made, or that investments in technology can never be useful. It just says that at present — and implicit in there is the qualifier “in India” — most investments in technology are wasted. What I will do is to argue that this waste is because technology requires a deep back-end to support its use for it to be worth the money. Furthermore, one has to be wary of the siren call of fancy technology when even the basic conditions required for learning are not met. 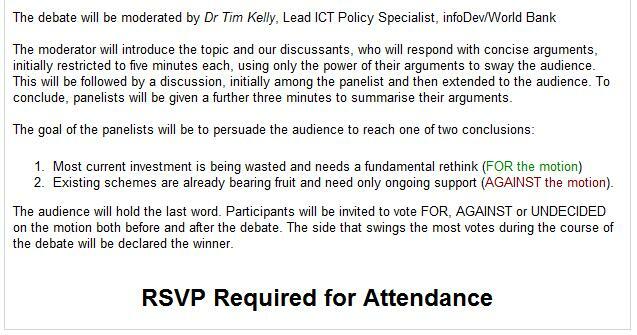 I am looking forward to the debate. It is a free event but registration is required. There are some tickets available for in person attendance and also for the Webcast. You can sign up here. I don’t think technology is of much use in classrooms anyway, not at the present stage. Laptops in classrooms are little more than irritants which disrupt the learning process, and powerpoint presentations have been shown to make children ask lesser questions about what is being taught than if a black/white board is used. more research in this is definitely required, but schemes like OLPC are just crap. If we talk about majority,this technology is still something only heard but not experienced. For rest it has been a half hearted act done only for worse. teachers simply reading out all presentations, students saving pasting every bit on slides so as not much is to be understood and answered. orruption consumes most of funding and rest is wasted due to lack of motivation at grass root. Human touch can never be totally replaced by technology however it is a good idea to use technology to support human efforts to create a generation exposed to possibilities. Yes most of efforts are getting wasted but we can not avoid it. If we are to compete we need to find a way and that level of motivation where benifit flows to majority. The real debate should be “Are most in investment in Education wasted?”. These investments could be of many kind, infrastructure (fancy gates, AirCons), sports facility, meaningless training, Technology,…yes, Technology is just one of them. New age Technology (Internet, Computing device, Audio/Visual) is just like how paper/textbook are used for holding learning content. The paper perse doesn’t guarantee quality education, its only the content, teacher in the class and culture of the class/school determines best learning. For new age Technology there is no options but to embrace it. Nearly all real-world work depends on these technology. If education is preparing students for realworld. Technology means is a must.